Chris shows us how to create a gorgeous layout for those Easter photos. She uses a number of techniques including tag titles, eyelets and brads, fibres and fancy mats. This page was made using Yellow Cardstock, Chatterbox Triple Powder Stripe, Powder Plaid and Rosey Stripe double-sided papers, Provo Craft Wedge Multi Sherbet alphabet stickers, Xyron Create-a-Sticker 150, Francheville eyelets and large brads in assorted pastel colours, ricrac, fibres, chalks, Carla Craft flower punch (two sizes) and Suzy's Zoo Easter Bunnies stickers. Using the Chatterbox Triple Powder Stripe as your background paper, cut two 5cm and two 3cm strips of the Rosey Stripe paper. These will be your top and bottom borders. Place a 5 cm strip (stripes up) at the top and bottom of your background paper. Adhere a 3cm strip (no stripes) on top of these, as shown in the layout. Tear a 1 � cm strip from the left over Powder Plaid paper and with stripes right side up place on the top border as shown in the layout. Run two pieces of ricrac (36 cm lengths) through your Xyron machine and adhere on the borderline of the Rosey Stripe Borders. Next cut four 11 x 11 cm mats from the Powder Plaid paper (stripes up) and four 10 x 10 cm mats from the yellow cardstock. Place the yellow cardstock mats on top of the Powder Plaid mats. Tear four 10 x 1 � cm strips of the Rosey Stripe paper (stripes up) and adhere to the top of these. Set eyelets in the corners of each mat. Crop two photos to size and place them on two of the mats. Position the rabbits from the Suzy Zoo�s Easter stickers as shown on the other two. Attach brads to the sides of these, wrap fibres around the brads and take the fibre ends to the back. Cut two 2 x 5 cm rectangles from the Rosey Stripe paper. 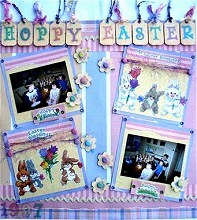 Place the Happy Easter and the Happy Spring stickers on each and place on bottom of the photo mats with mounting tape. Now position and adhere each of the four mats to your page as shown in the layout. For the title �HOPPY EASTER,� cut tags from the yellow cardstock and lightly chalk the edges with pink chalk. Adhere the Provo Craft Wedge Multi Sherbet alphabet stickers to them, set an eyelet in each and thread your fibres through. Attach the tag title to the top of the page with mounting tape. Next, use your Carla Craft large flower punch to punch 8 large flowers from yellow cardstock. Repeat using your small flower punch and the Powder Plaid paper. Attach the small flowers to the large flowers with brads. Place these randomly around your layout, as shown above. Finally, use the Provo Craft Wedge Multi Sherbet alphabet stickers and put the date the photos were taken in the bottom left hand corner.